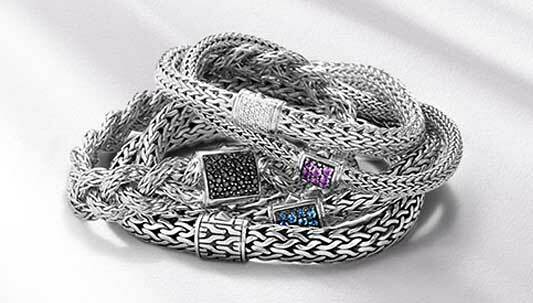 The most instantly recognized John Hardy jewelry collection is the iconic Classic Chain, with a woven construction that has become the designer’s signature. The braided bracelets, created using the rentai (the Balinese word for “woven chain”) technique are hand-made, link by link, with finished pieces having a smooth, supple drape that follows the contours of the wrist. Available in sterling silver, 18kt gold or two-tone sterling silver and 18kt gold fabrications, the bracelets are often adorned with gemstones that include amethyst, black sapphire, blue sapphire, diamond, Tsavorite and other colorful favorites. The everyday elegance the pieces exude is the result of the exacting work of the talented team of skilled artisans working on the John Hardy compound. Oftentimes, one person will work on a single Classic Chain bracelet from start to finish, with the original bracelets requiring four hours of weaving to make one inch, and 10-12 hours for an inch of chain in the more recently designed reversible bracelets. The graphic element of the woven chain bracelet has been used as a decorative element on the silver discs of the Classic Chain beaded bracelets, as well as on the stations of the collection’s cord bracelets.